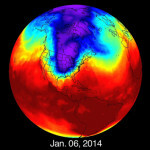 http://www.jonathancloud.com/wp-content/uploads/2014/02/nasa-polarvortex-drop.jpg.CROP_.original-original-300x300.jpg 300w http://www.jonathancloud.com/wp-content/uploads/2014/02/nasa-polarvortex-drop.jpg.CROP_.original-original.jpg 354w" sizes="(max-width: 150px) 100vw 150px" /> NASA Goddard Space Flight Center[/caption] — Of course this is not the first 'Arctic winter' to be experienced in the U.S., though it dropped record amounts of snow and broke all of the low temperature records set since the National Weather Service started keeping them in the 1870s. And the disturbance may well be linked to climate change. According to Phil Plait writing in Slate (Feb 2014): "warming water in the Arctic leads to ice loss which leads to more warm water. Some climate scientists think this may be disrupting the air flow in the polar vortex, which in turn leads to the meanders in the jet stream. This idea is pretty new and not yet verified. But the irony is clear: If these scientists turn out to be right, not only does the cold weather not disprove global warming, it may actually be caused by it." In short, we are now living in the age of climate change in a way we haven’t really started thinking about yet: exactly how are we going to adapt to it?